Check this page often for updated listings of all of our rides. Rides require, at minimum, an appropriate bike in good working order, water, and a helmet. We suggest a spare tube, energy food, maybe a little cash in case we stop, and your biggest smile! Many rides are held subject to weather. We'll see you out there — and have fun! Please obey all traffic rules and signs. Helmets are required and riding with ear-phones is not allowed in the group. Please do not use the Triathlon/Time Trial bars in the group. No Ear buds or cell phone usage in the group. Additional descriptions of the rides can be found below. Slow roll around Southern Pines about 6 miles. Mild paced ride of about 20 minutes followed by snacks. Duration is typically 1.5 to 2 hours of fast,pace line riding. Efforts will be made to maintain group integrity while keeping the fastest speed. If you get dropped, be prepared to find your own way home or hook up with others to cruise back to Southern Pines. Please note that the group must obey all traffic laws AND respect the yellow line rule. This is pretty self-explanatory so be prepared to get yourself back to SoPi. Group riding skill level recommendation: "Experienced"
Peloton rules are in effect. In other words, the ride progresses as the Peloton sees fit which often means no waiting to be asked to pull-through, and the Peloton enforces etiquette…remember, it’s a simulation so there are no officials! The drop policy is to try to keep riders starting with the group with the group unless ride leaders and the rider determine dropping off is a better alternative for the group and/or the rider. Ride leaders will check in with any rider before that rider is dropped. Recommended average speed will be 17mph overall. Easy to moderate paced ride focused on giving riders a chance to catch up with each other while easing into the weekend. This ride is as long as the group wants to make it but usually ends just in time for “happy hour”. No one getting dropped here unless they are a grumpy muppett spoiling the Friday afternoon fun. Group riding skill level recommendation: "Knowledgeable"
Social road ride around town followed by coffee. Duration about 30 minutes easy pace all bikes welcome. Social ride around town followed by snacks and beer at the Growler Store. Duration about 30 minutes easy pace all bikes welcome. 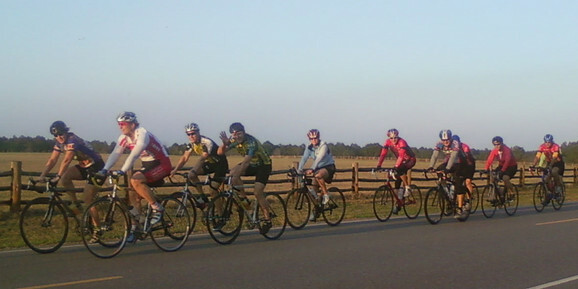 Looking for the some weekend exercise, then swing by and consider a weekend group ride. These rides totally depend on who shows and who goes but previews are often posted to the SCC Facebook page. Routes, duration's, pace and style of the ride are all finalized at the start but will typically follow the general riding season: shorter rides in Winter/Spring, longer rides in Summer/Fall. At the start, the group can/will adjust based on what folks want to do or you can always choose to go your own way…so If you are not sure of any aspect, please pose questions to the group so that you know what you are getting into. Get some endurance work with a longer steady paced group effort. Ride distance will be between 45 and 65 miles with a rest stop along the way. Participants should bring adequate food and hydration for the distance and weather conditions. SCC does not warrant the safety of routes selected for rides. Roads are NOT closed for cyclists. Cyclists ride at their own risk and assume total responsibility for their own safety. SCC, its organizers and ride leaders will not be responsible for any injury or damage to any persons or property that may arise from participation in the ride. Rides are considered cancelled if it’s raining. If you need additional information check out the SCC Facebook page or please send us an email at sandhillscycling@gmail.com. Mild to moderate paced ride of about an hour with a no drop policy. The goal of the ride is to introduce novice riders to group riding skills/etiquette and to provide an opportunity for riders new to the area to experience SCC group riding. Group will adjust to stay together at all times. This is the ride to learn the basics of riding in a group. The emphasis is on safety…both yours and the groups.